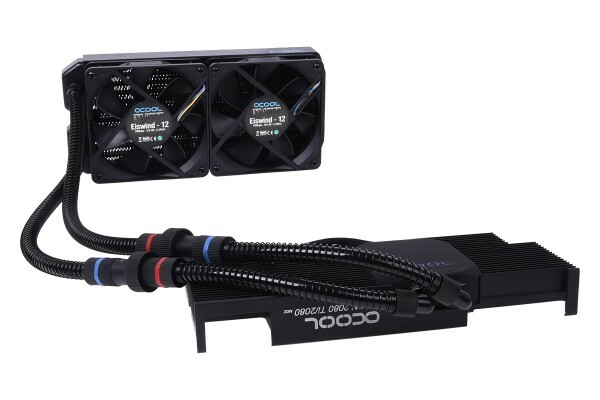 The Alphacool Eiswolf 240 GPX-Pro is the first prefilled AIO water cooler for graphics cards with an integrated pump. What kind of fluid is this unit pre-filled with? I would assume just distilled water or does Alphacool use their own coolant (CKC Cape Kelvin Catcher etc.)? If coolant isn't being used, would adding an additive like Aquatuning anticorrosive AntiCorro-Fluid (Article no. : 30009) void the warranty? Hello, you can use without problems distilled water or the CKC from Alphacool. The AntiCorro-Fluid won't be void the warranty but the radiator must not bring any production residues into circulation. Hello, no that's not compatible. In the description you can find a pdf file with all compatibilities. After three months of running this on an RTX2080: temperatures under load are 40°C lower than the stock cooler. Extremely quiet, particularly compared to the (annoying) fan whine that the air cooler produced. Quick and relatively easy to install. Brilliant product.